*) 10% of the book sales goes to the A21 campaign (women trafficking). earthquake, witch doctor, sickness and family trouble, to a new life in a foreign land. Although barely believable at times, this astonishing story will fill you with hope, as you are inspired by her courage in the face of overwhelming adversity. The story begins in Indonesia, where personal troubles cause her to start searching for a way to make things better. But as she just begins the search, her world is shaken by riots and earthquake. Although barely surviving with her life, she finds a new friend, who will transform her world. In this incredible story of hope, you will follow her to China and then to Europe. Along the way, you will discover how she strove to overcome debilitating sickness, break free from past superstitions and see her parents reconciled. Told in a matter-of-fact way, this is a story of how determination can change a person's life, and continue to inspire countless others. *) 10% of the book sales goes to the A21 campaign (women trafficking). This is one girl's incredible true story. A story of escape from earthquake, witch doctor, sickness and family trouble, to a new life in a foreign land. Although barely believable at times, this astonishing story will fill you with hope, as you are inspired by her courage in the face of overwhelming adversity. The story begins in Indonesia, where personal troubles cause her to start searching for a way to make things better. But as she just begins the search, her world is shaken by riots and earthquake. Although barely surviving with her life, she finds a new friend, who will transform her world. In this incredible story of hope, you will follow her to China and then to Europe. Along the way, you will discover how she strove to overcome debilitating sickness, break free from past superstitions and see her parents reconciled. Told in a matter-of-fact way, this is a story of how determination can change a person's life, and continue to inspire countless others. - Sofi Angel has poured the words from her heart on to the page. Her recounting of these incredible episodes in her life is simple and clear, yet paints a wonderful picture of the power of the Holy Spirit. I was with her, reliving every situation as I read through each chapter, and I congratulate her for having the courage to share her story with the world for the greater good. 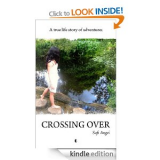 -Crossing Over is a moving, genuine story of overcoming great challenges. Sofi's fortitude and persistence is an inspiration. I highly recommend this book to anyone needing encouragement in facing seemingly insurmountable difficulty.